Commonly known for adopting a slow and measured approach to major reform, China has surprised markets with the speed of its moves to internationalize its currency. Its latest move, to allow mainland Chinese enterprises to use yuan in overseas direct investment, follows on the heels of two landmark decisions taken in December to ensure the continued supply of the currency in Hong Kong and to extend a cross-border trade settlement scheme to 67,359 domestic exporters from the original 365. Taken together, these measures have helped affirm Beijing's commitment to spread yuan abroad and have dispelled investor anxiety over a temporary shortage of the yuan's supply in recent months. "The renminbi will go global at a faster-than-expected pace with the most potent potential lying in emerging markets," says Qu Hongbin, co-head of HSBC's Asian Economics Research. "Now the renminbi holds both trade and investment channels to go abroad." The offshore yuan market remains small and concentrated in Hong Kong, where deposits totaled 279.6 billion yuan ($42 billion) as of November. Nearly 80% of this was newly added during 2010. It is also mostly a one-way—outward—flow, aimed partially at tackling domestic inflationary pressure. 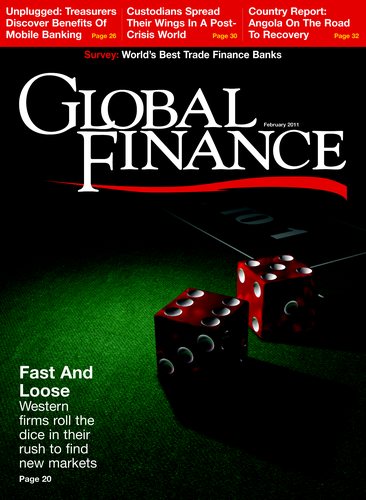 With the relaxation of investment rules, Chinese companies, which are already the world's fifth largest source of foreign direct investment, could take the yuan to emerging markets, the destination of nearly 90% of China's outward investment totaling $56.5 billion in 2009 and $22.4 billion in the first half of 2010. 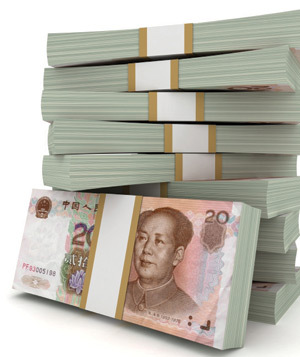 The bulk of the offshore usage of the yuan is in settling trade payments. Analysts expect that to remain unchanged for some time, despite the proliferation of various new financial products. Since a pilot scheme was launched in 2009, the cumulative volume of trade settled in China's currency has reached about 410 billion yuan, of which 80% was paid by importers for goods shipped into China. Volumes are set to swell to hundreds of billions per month in the near future. Analysts at Standard Chartered predict yuan-denominated settlement will expand from less than 4% of China's total imports in the third quarter 2010 to more than 8% in 2011 and 12% in 2012.